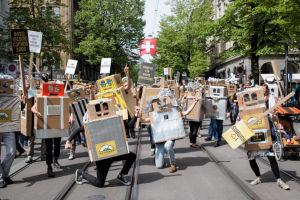 This Sunday, June 5, Switzerland will be the first country to vote on whether or not its citizens should receive a universal basic income (UBI) of $2,600 per month. The proposal would guarantee a payment to every citizen (and $650 per child), without any pre-conditions or work requirements. Liberal advocates argue that a UBI will become necessary as jobs are replaced by automation. They say it’s more humane than a patchwork of means-tested welfare programs. Some conservatives support it because it would streamline government services, while others worry that it would take away the incentive to work. Although the referendum is unlikely to pass (most Swiss politicians have spoken out against it), it’s an idea that’s becoming increasingly popular around the world. Finland, The Netherlands, and Canada are among the handful of countries expected to implement basic income experiments in the coming years. We may soon live in that world. In addition to the Swiss referendum, a charity called GiveDirectly is launching the first long-term basic income experiment in Kenya. At a cost of $30 million, the program will provide a basic income to 6,000 Kenyans for over a decade. There’s some evidence to suggest that a basic income could increase entrepreneurship in developing countries, and GiveDirectly hopes to prove it. Will more empirical evidence convince other countries to follow suit? The U.S. came close to passing a basic income bill in 1970 under Richard Nixon’s presidency. Although it passed the House of Representatives, it stalled in the Senate amid concerns that it could lead to a rising divorce rate. An experiment in Manitoba, Canada, ran for several years in the 1970s, but was eventually phased out. For now, the idea may have the most potential at the state level. The Alaska Permanent Fund serves as a kind of basic income, providing up to $2,000 per year to each citizen. A proposed bill in Oregon would tax carbon emissions and distribute around $1,000 per year to state residents. Smaller groups could give the idea some momentum too. Silicon Valley’s Y Combinator is hiring a researcher to spend 5 years studying the impact of basic income, while the My Basic Income team raised funds on Indiegogo to provide a BI of $1,250 per month to one individual for a year. What about intentional communities? I’m not aware of any that provide a full UBI, but income-sharing communities like Twin Oaks come close. In return for a certain number of hours of work per week, members can rest assured that their basic needs, including food and shelter, are covered. If enough intentional communities did the same, maybe we wouldn’t need a referendum or ballot measure to make it happen. What are your thoughts on basic income? Would you vote for it if you were a Swiss citizen? Leave your thoughts in the comments below. The US could start a $trickle-up$ experiment by providing a $3,000 income per month to all armed forces veterans who want to participate in it. Its viability may be monitored by tracking veteran suicides. Tracking could compare each year’s statistics to the year(s) before Universal Income began. Cycles of 7 year trends could then be compared to the immediately previous 7 year cycles leading into the past. A forward span of 35 years would be mirrored against the backwards-in-time span of 35 years. The cycle count could change to every 5 years after the 35-year-span when veterans become more susceptible to suicide as they age. As it is now, Veterans who have nothing to do with Veterans Affairs are less likely to kill themselves and more likely according to its own 2012 analytic study, to take their own life if they have to deal with government civil servants. Alternative healing resources would also be more accessible leading to a revolution in healthcare as current military acceptance of acupuncture has proven. Veterans are educated enough to make positive changes not only for themselves, but others too. But the competition for meaningful employment in a world which seeks to make its citizens vulnerable by providing demeaning half-time jobs and easy to manipulate with threats of being outsourced, compounds the need to readjust after the strict discipline of combat. In short, commonsense will NOT be impugned by providing a universal income to veterans. However, the political fear of a veteran helping him or herself successfully will become an obstacle. Instead of living up to the image of being victims, a guaranteed income will prove in the lives of every veteran the truth of our founding principles. Life-Liberty-&-the-Pursuit of Happiness are in everyone’s best interest; not the contrary. In America, where there is not a real autonomous worker Social Security System the Universal Income debate is not parangonable to the one in Europe. From our point of view, to present this system as an alternative to Social Security only can provoke more and more xenophobia and inequality.